Greetings, readers. Last Friday my new kitten arrived and for the first three days and nights all I did was hear her. She would come out in the cover of darkness, use her cat box, and eat a little something. This is the only way I knew she was okay and hadn’t died of shock from moving into her new home. On Monday, my friend Tasha from work, who gave me the kitten, came over to my place and bridged the gap between scared kitten and new owner. Once Princess Josie was placed on me, and I pet her and gave her the first little kiss on the head, all has been right with the world since. 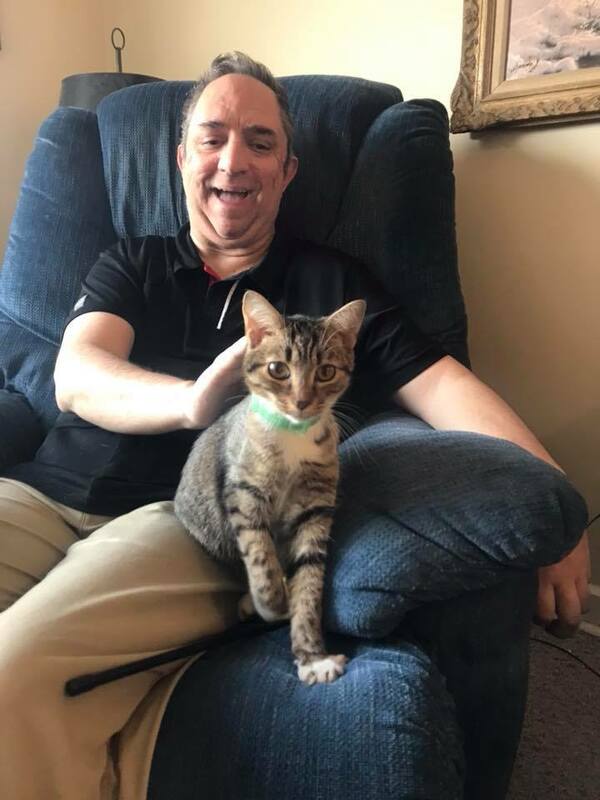 Here is a picture that Tasha took on her phone of me and the new kitten. I must say, she is very photogenic. Notice her pretty brown eyes. I believe she is Bengal or a Bengal mix. At only nine months old, I’m sure to have many great years with her, filled with love, affection, and cuteness. On to other topics, I’ll be taking a personal day tomorrow, to try out my new summer writing schedule which goes into effect in about two weeks. I’ll be working my fast food job through the Penn State graduation weekend and I will go back right before the students return in mid to late August. Also … finally the warmer weather has arrived. Though not hot by any means, it is at least warm. I can dig it. When I can go to work in my hoodie and leave the down coat behind, I’m a happy camper. Lastly, this is my therapy week, I’ll see my therapist later today as a matter of fact. I’m going to make certain to bring my computer with me to show off the picture of her royal highness, Princess Josie. Before closing, I just have to end with a funny for the day. I was watching YouTube videos of funny fails and I saw a little two-year-old girl happy and smiling while her daddy was flipping the channels behind her. All of the sudden he stopped on the news channel with President Trump talking. The little girl turns around, looks at the President, starts to cry and says, “No, no, no.” I laughed so much. Tomorrow Rebecca will either have a new entry or a re-post for you, and we will be back together next Wednesday. I hope you all have a great day, take care, and as always, happy reading. Greetings, readers. One week from today my new kitty cat Princess Josie will come home. She was supposed to arrive this Friday, but there was a slight delay. Actually that’s all right with me because I was not too keen on getting her home late on Friday afternoon and having to go back to work Saturday morning. That would’ve left her all by yourself in a strange place; not exactly the ideal situation. This week I’m going to go to Target and pick up such things such as food, kitty litter, treats, and other feline supplies. At some point before next Wednesday, I’ll have to go to Wal-Mart to pick up a new litter box. I will gladly accept all the chores that come with owning a pet. I’ve already been imagining the new routines we will form. I’ve not decided if P.J. will have the whole run of the apartment just yet, or whether I’ll keep the bedroom door closed to allow her to get used to the place one area at a time. 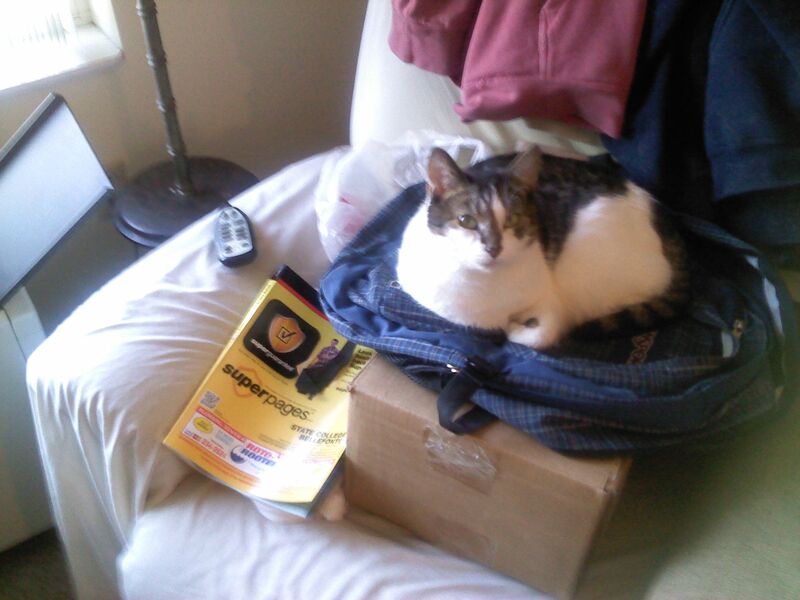 I am planning on getting a cat bed, which is something I did not do for Keekee. If Josie wants to sleep on me, she may do so. We’ll see if she takes to her bed. On to other news now. I am still debating on whether or not to take the summer off for my fast food job. I don’t want to lose the money, but my feet are hurting me more and more. I know I shouldn’t complain. I know everybody’s feet hurt. Perhaps it has something to do with my cerebral palsy, but at the end of the day I feel half crippled. When I first started almost a year ago, I was told by family and friends that my feet will adjust, and won’t hurt so much. Well, I have yet to see any improvement. I was told by one of my managers that lots of folks from work read my blog. So, after today, probably more than one person will know I’m thinking about taking time off. If I did take the summer off, I would use it to rest my feet and write. I have family coming in about a month from now, so if I decided to take time off, it would be between May and late August. I would come back for the Penn State football season and the beginning of the new school year. If there was no job waiting for me when I returned, that would be my own fault. Finally, I’m going to undertake a massive effort today and tomorrow to clean up the apartment and take care of chores which are long past due. I must tend to my banking, and pay off a bill. With my short-term memory issues, making a written list of everything I must do is going to be essential. I’ve got a notepad just the right size for such a list. I also need to stop at the pharmacy to see if they have a pill splitter. My new heart medication must be taken a half tab at a time. Here I was slightly overdosing two days in a row. I’m glad I caught my mistake early. That’s going to be it for today folks. More tomorrow. I’m not certain whether Rebecca and I will get together for work here in the office, but either way I will dictate the blog entry via the speech recognition program, and Rebecca will edit it. Until next time around, take care, have a great day, and happy reading. Greetings, readers. Keekee passed away this afternoon at 2:10. Joe will probably post a blog entry about this soon with his feelings and thoughts. I wanted to put up an entry with the news and a few photos of her today. She had cancer, and Joe didn’t want her to be in pain or suffer. She was at the vet’s for two nights and then today they put her to sleep. Joe was with her. I am feeling sad, of course. 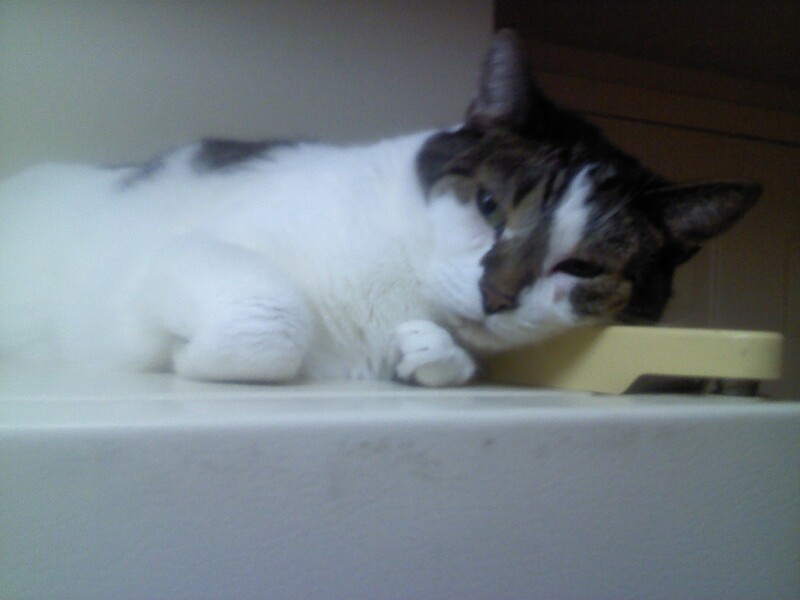 I’m used to seeing Keekee every week when I go to work with Joe in his office/apartment. She was usually quiet while we worked, though every once in a while she would want all the attention in the room on her. I haven’t thought about it lately because it has been a long time since she did it, but once in a while she used to just zoom from one end of the room to another and we never knew what set her off. All work would stop for a few minutes until she calmed down again. 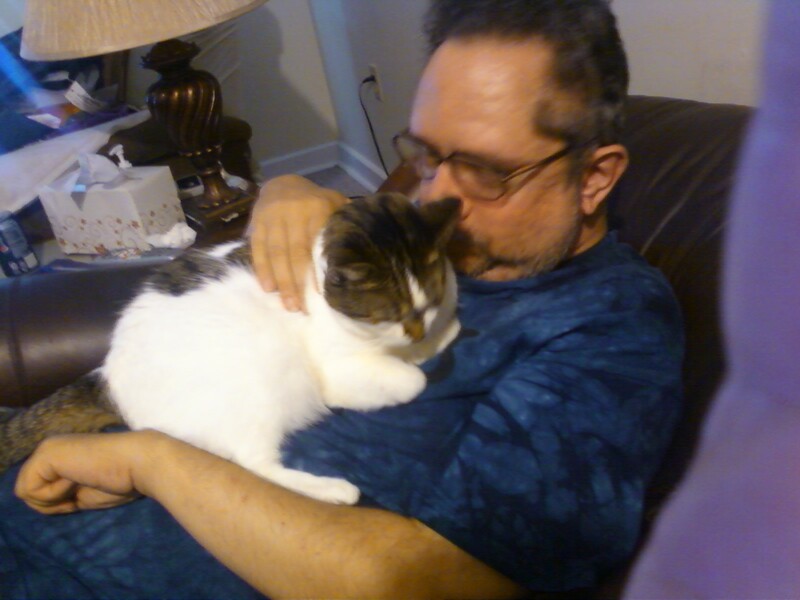 A lot of times she would curl up on his lap when he dictated the blog entry, and then jump up ready to eat when he asked if she was ready for dinner. Those of you who are long-term readers of this blog know that Joe goes to Bear Spring Camps in Maine every August and that while he was away for that week and a half, I would take care of Keekee. I made sure her water bowl had enough water, that her dry food was full, that she got half a can of moist food, and kept her company for a few hours. I would post entries about how she was doing and how much she was shedding (she shed so much when Joe was away!) By the end of the first week he was gone, she would want to be pet a lot. It was actually the only time I would pet her so much and for so long in one sitting. I promised photos and here they are. I will miss Keekee very much. Greetings, readers. Today’s entry was going to be a R.I.P for Jean Bennett, who passed away recently, and I will write that soon, but something happened yesterday that is filling all my thoughts. I had to take my beloved kitty cat to the vet, for she had a lot of mouth pain. As it turns out she had two bad teeth which had to go … that was the easy fix. She also has a tumor on her tongue. That might not be able to be fixed. She stayed at the vet’s office overnight and will be examined thoroughly today as well as operated on as necessary. They are also going to do a biopsy on the tumor, and the results won’t be back for five or six days. I’m hoping that one of the vets can simply remove it today. If they leave it in her until next week, which will facilitate a follow up appointment, I’ll have to watch her not eat for seven more days. That will make Joe’s stress meter run high. I just called a moment ago to see how she survived the night. Keekee is an indoor cat, and she is not used to being away from home for more than a few hours at the vet’s office. The nurse says she was hiding behind her little litter box, but other than that she was doing okay. She’ll be put under mid-afternoon and my vet said he will give me a call when the procedure is finished. I’m hoping she’s done today so I can go out and bring her home, because I have shifts at my fast food job the next two days. Keekee takes precedence however, so I may have to call off to pick her up and bring her home. Last night was very strange, not having Keekee here, as was this morning when she didn’t come running for her breakfast after my alarm went off. I’ve never thought of Keekee as a support animal, but I suppose she is. My family and I have always had pets, and if it is Keekee’s time to go to kitty cat heaven, I will wait until after this coming camp and then look into perhaps getting another feline friend. Just to be clear though, nothing will ever replace Keekee. No other animal will have her exact habits again. There is still a decent chance that everything will turn okay and she will be around for many years to come. I am preparing for the worst and hoping for the best. To the Bennett family: Mrs. Bennett was a dear friend of mine and at Bear Spring Camps was one of my mom’s crowd, as I like to say. An R.I.P. in her honor will be written next week. Until next Wednesday, take care, think warmer temperatures, and as always, happy reading.